Launched with a special offer from Tata Indicom, Fly CG588 is the latest festive season gift for buyers seeking dual SIM phones. 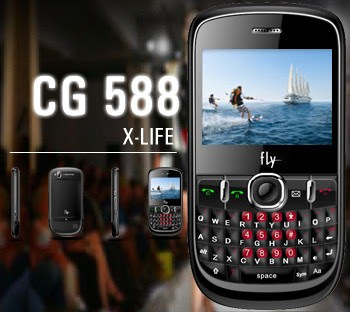 This immensely affordable dual SIM mobile handset from Fly, new “Fly CG588” is offered with a special offer scheme in India. This candy bar phone also offers fast and easy social networking apps. The Fly CG588 has a 5.8 cm, TFT display with 262K colors and its screen resolution is 320×240 pixels. Priced at Rs. 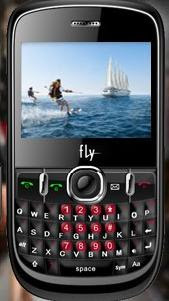 4795, Fly CG588 is supported on both CDMA & GSM networks. This black colored mobile handset comes with a full QWERTY keypad. Its physical dimensions stands at 96.7×53.6×14mm and it is also light in weight as it just weighs 95g. This feature makes it very easy to carry around. It houses a built-in FM Radio, and a music player that plays music of choice in various formats. There is universal 3.5 mm audio jack in the phone. The in built 1.3 Megapixel camera of the phone has video recording feature. For connectivity purpose, there is a Bluetooth and USB in the phone. The memory of the phone is sufficient to store 500 phonebook entries with Photo Caller ID and furthermore expandable to as much as 4GB. The handset memory can also save 300 SMS and supports Java Games. Fly CG588 incorporates cool social networking applications as Nimbuzz multi-chat messenger and Snaptu for quick web access. There is a dedicated camera key and dedicated volume key onsides of the handset. Other inherent stuff in the phone is e-book recorder, USB modem and MP3 ringtones. The standard 1500 mAH Li-ion battery delivers talktime of 5 hours on CDMA network and 8 hours on CDMA network. The stand by time is 300 hours on Fly CG588. Tata Indicom users will benefit with new Fly CG588 users as Rs.104 recharge for the first time is free with the phone. Also, 1GB data can be used for free along with 250 SMS’s worth Rs.1500 with Fly CG588.